I wrote this story for my 7 year old cousin. It's about her adventure to Neverland. Not the Peter Pan wonder world however. This is the place of imagination that was part of a game we used to play. The underlying message I tried to put across is, as always, to be kind, caring and helpful. Jenny is one amazing little girl! She’s amazingly pretty, amazingly clever and she has an amazing ability. Jenny can talk to fairies! There are lots of little girls who can talk to fairies, but only Jenny is allowed to remember when, where and which fairy she talks to. Jenny’s amazing ability also permitted her to grow wings and fly. This makes it easier for Jenny to talk to the fairies. She was gifted so generously because Jenny is always helping out magical creatures in a special land called ‘Neverland’. Neverland is a truly magical place, full of endless green meadows that are always covered with the most beautiful flowers that the seasons would allow, but that wasn’t the only reason Jenny found the meadows exciting. She was the one who controlled the flowers and that was exciting enough for her! Neverland also had beautiful waters that were crystal clear, with a hint of aquamarine blue, and they always sparkled. The only thing more magical, than the meadows or waters, would be the sky in Neverland. It was not blue, with white fluffy clouds, and it was never, ever grey. Instead it was a magical assortment of purples, pinks, blues, greens, in fact; it had all the colours of the world, in one way or another. Jenny has a twin brother, Ethan, and an older sister, Isabel. The three of them all know about each other’s powers and together they go on adventures throughout Neverland and have stories written about them. This story is about Jenny and the meadows of Neverland. You can only enter Neverland when you sleep and this night, when Jenny laid down and heard the distant tinkling of bells, she waited for the smell of green grass, pine and spring flowers, mixed with fresh water, but it never came. She smelt the sea water, but where were the smells of her flowers? Of roses, bluebells and lilies? Jenny opened her eyes, jumped back, and gasped. She heard the dry twigs break beneath her feet. Her once beautiful meadow was now a barren desert. Everything was dry and dead like a wasteland. Jenny fought hard to hold back her tears. Jenny called out to her fairy friends. “Sapphire?” She yelled. “Ruby? 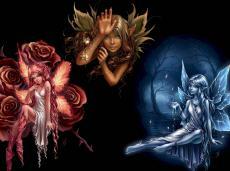 Amber?” At once the three fairies appeared but they looked pale and unwell. “Oh my gosh guys! What has happened here?” Jenny asked. “There’s no water!” The little blue fairy, Sapphire, said. “The fresh waterfall that waters everything isn’t running anymore.” Said the yellow fairy, Amber. “Help us; we don’t know what to do!” Pleaded the red fairy, Ruby. “We guessed that! And we checked! It’s like the water just evaporated!” Interrupted Ruby, who was a very impatient fairy. “Yeah. It’s like every day the water level shrunk, like it was going down a plughole, and now there just isn’t any!” Said Amber, who always added on her thoughts after another fairy spoke. “Evaporated?” Jenny wondered aloud. The three fairies nodded together. “Does anyone live underground?” Jenny asked. “Well there’s Mole; but he doesn’t bother us so we don’t bother him.” Said Sapphire, who was so gentle. “Yeah he never comes up to smell the flowers.” Added Amber. “I can imagine.” Jenny scowled. She thought it wasn’t fair at all that no one went to see the mole. He would undoubtedly be lonely. It was then that Jenny had an idea. “Could the Mole be stealing the water?” She wondered, and this made the fairies giggle. “Hehehe. Mole is not A Mole!” Sapphire laughed. “Yeah he’s not an animal. Although he is a boy, so I understand why you made the mistake!” Chimed Amber. Ruby, who had stopped laughing and became irritated with the others, explained that Mole was actually a young scientist, called Michael, who was nicknamed Mole by the fairies because he lives underground and his name began with an ‘M’, like the word ‘Mole’ does. Jenny still thought she needed to talk to this ‘Mole’ “What’s his real name again?” She asked. “Michael.” Said that fairies together. “Take me to him.” Jenny commanded. Jenny flew with the fairies. The air felt warm on her face and cool on her wings. She couldn’t help smiling as she twisted and turned, rose and dived, enjoying the feeling of flying. It was over all too soon. Even going around the world and back never took any longer than eight days because a fairy’s wings can beat so fast! In fact, if a fairy had already been where they wanted to go, they could be there in seconds! Jenny, however, had never been to Michaels, so the fairies had to take her the long way. Even still it didn’t take and longer than a minute or so. The entrance to Michael’s underground house was no more than a big, square, wooden door; which was actually two smaller rectangles with handles, towards the dividing line, so they could be pulled out to hang open. (Or pushed out by Michael.) “Wells there’s no ‘Do Not Enter’ sign.” Said Jenny hopefully, breaking the silence. “But there’s no ‘Come On In’ mat either.” Said Ruby, warily. “Maybe there’s a main entrance and this is the backdoor, so he wouldn’t decorate it.” Suggested Sapphire. “Yeah.” Added Amber. Jenny made a face but she shrugged. What a puzzle! No sign saying they should back off, but no sign that felt even remotely welcoming. It didn’t matter. Jenny felt brave. She knew she had to get to the bottom of the water shortage. Jenny took a deep breath and opened the doors. A gust of wind washed over Jenny and the fairies. She could feel the cold water down below. She closed her eyes and knew she was right. She smelt the green grass, pine and spring flowers, mixed with freshwater. Michael, ‘Mole’, the Scientist had taken the freshwater; which anything living on land depended on in Neverland. Sure there were mermaids in the salt water, but otherwise it was too poisonous for anything else. Jenny giggled to herself. ‘It’s a good thing Michael didn’t steal the sea water; otherwise Neverland wouldn’t be connected to the world anymore!’ She thought. “Come on. Let’s get to the bottom of this!” Jenny announced, and she (fairies in tow) flew down the cellar doors. The tunnel to Michael’s laboratory was dark. Jenny was scared to think what she was flying through. They saw a bright, shining light and, for a split second, Jenny thought she must have died and gone to heaven. However, that could not be right! Jenny and her fairy friends continued travelling downwards. Jenny looked around for Michael, but she could not see anyone. She called his name. “Yup.” Answered a voice behind her. “Oh! You’ve built an incredible room!” Jenny commented. Michael looked like a person, like her; a boy, of her age; and he was friendly! “It’s called a biosphere.” He explained. “It’s a Rainforest in a small sphere. Well. Kind of.” He continued. “You mean you’ve built a huge biosphere to?” Michael gasped. “Will you visit me?” Michael asked his new friend, hopefully. Jenny nodded enthusiastically. “Well okay then. By the time you get back to the surface, all the water will have been returned.” Michael agreed. Sure enough, by the time Jenny surfaced, the fresh water smell had returned. Water was falling, grass was growing and flowers were blooming. ‘Now.’ Thought Jenny. ‘Where to put Michael’s Rainforest? I know! The South-East Corner of the Meadow! I always run out of ideas for what I should put there!’ “Come on guys!” She said aloud to the fairies. “Where are we going?” Asked Sapphire. “To the South-East Corner of the Meadow. Here I’ll leave a note for Michael to let him know where to find us.” Jenny left the note and then she and the three fairies disappeared, only to reappear at the Meadow’s South-East Corner in a split-second. The South-East Corner of the Meadow was huge and green with lots of towering trees. There was a lake of sea water that joined all of Neverland and a waterfall of fresh water at the back. Jenny decided to transform the waterfall so that the falling water would part to make a cave visible, which Michael could use for his house. She then made all the trees grow large and exotic, like they had come straight out of a book on rainforest trees. Jenny also transformed the flower beds so that they matched the assortment of species and arrangement of colours that Michael had grown underground. When she finished, Jenny was amazed. “Wow.” Said a voice behind her. “It looks beautiful!” Jenny spun around. “Definately! The very next time I’m here!” Jenny beamed at her new friend Michael. When Jenny woke up, she was happy that she had once again saved Neverland with her intellect and special abilities. She was also excited at the thought of having a new friend to visit when she returned to Neverland. Jenny rolled in her bed to feel something lumpy beneath her pillow. Jenny found a letter from the fairy King and Queen. ‘Dear Jenny.’ It began. ‘Thank you for finding out where the freshwater was being drained away to. We are very sorry we couldn’t be there to assist you, but we had to start the long process of purifying the sea water. We’re so very glad that you solved the mystery so quickly. We have never had a problem with Michael before so it was a surprise! And it really does take a long time to purify so little water! Distilling, filtering and cooling means water tends to evaporate quite a bit, but we can’t complete the process with a large amount of water as not all the salt would be removed. As you know that’s very poisonous! Anyway. Thank you again. Here’s a little something for your efforts.’ Jenny looked past the paper and saw a beautiful rainbow coloured flower. It was so gorgeous! ‘It never needs water, you can take it anywhere, and it will last forever. Like our love for you. The Fairy King and Queen.’ Jenny smiled gratefully. © Copyright 2019 NicoleEzekiel. All rights reserved.